ONE of the nation’s largest beef processors plans to provide all livestock suppliers with detailed animal health performance on slaughter cattle by early next year. The move is part of a broader vision by Teys Australia to embrace Value-Based Payment systems with suppliers over the next couple of years. Teys general manager for corporate affairs, Tom Maguire, gave a brief glimpse of the project during last week’s Australian red meat industry digital forum in Brisbane. The company says the expanded feedback process will start later this year, with an intention to be fully implemented by March. Trials have taken place over the past six months. 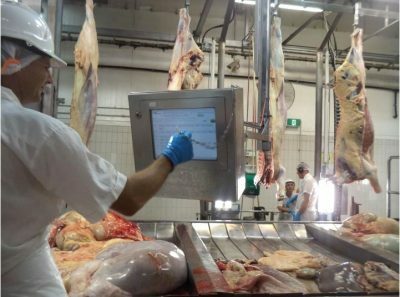 The process will see the installation of IT systems in all Teys Australia plants across Australia to allow the company’s third-party independent meat inspectors to capture data on an individual animal level for condition of offals, using touch screens at their work stations. The information will be provided to vendors as part of their feedback sheets. Condemned offals due to preventable parasites and diseases cost the Australian red meat industry tens, if not hundreds of millions of millions of dollars each year, surveys suggest. Equally importantly, the cattle from which the offals came are often compromised in terms of growth rate and eating quality performance, reducing their overall value. It’s difficult to establish exactly what the accumulated effect of animal health issues affecting offals is on the Australian cattle industry. This recent survey suggested internal parasites, alone, cost the beef industry about $95 million a year. At an operational level, it is not unusual for a beef plant to see 30 percent of livers condemned in a run of cattle for a day. That takes a 5-6kg steer liver worth perhaps $7-$10 back to rendered meatmeal value worth just cents per kilogram in finished MBM form, based on data from MLA’s most recent co-products report. Teys proposes to collect and supply feedback information on a variety of animal health issues, depending on each plant’s location and type of cattle being processed. That list will include lungs, livers, kidneys and other items. Each entry will be linked back to individual carcase numbers. Liver fluke, for example is an issue in parts of southern Australia, but not in Queensland. Similarly, different emphasis will be placed in grassfed and grainfed cattle due to BRD and other issues more specific to fed cattle. Hydatids in livers are a significant issue in some areas, especially where a growing wild dog problem exists. New touchscreen data capture units being used as part of the project have the ability to capture information on up to 30 separate attributes. “Initially, we want to target just two or three key issues for a communication message with producers, in each region,” Mr Maguire said. Teys also plans to link the animal heath feedback information with grading performance. “We think it will help reinforce what we already know to be the case – that animals that are compromised by disease or parasite infection during their life often under-perform in the chillers. We know, for example, that liver condition can affect eating quality,” he said. Teys will try to develop information around what the cost of such performance compromises are, in an effort to better educate producers about the need to appropriately manage cattle for animal health issues. When pressed by Beef Central, he said offal value could one day be part of the company’s planned Value-Based Payment structure. “But the important first step in that is to send the information out to producers, and incentivise them to change practises, where necessary – and then use the price signals to continue that. But there is no intention to do that for any element of VBM (also including yield, quality, offal condition) from day-one,” he said. Mr Maguire said a staffmember would be appointed at each plant to liaise with producers on how to understand, and if need be, respond to feedback signals on animal health matters from their slaughter cattle. The company will also work with Animal Health Australia to produce some fact sheets on the topic. So why hasn’t such an animal health information feedback process been made available to producers earlier? Tom Maguire made a thinly-veiled reference to the reasons in his address at last week’s digital ag forum in Brisbane, when he said the unwillingness to capture, share and utilise such information had been a “real failure of the industry” over the past 40 years. In essence, he was referring to the move away from antiquated and highly-inefficient Government-provided meat inspection to third-party meat inspection models. Under the Government-provided meat inspection system, inspectors routinely inspect offals and condemn those with faults. But at the same time they have steadfastly refused to engage in any process of recording such data, arguing that it is not a part of their job description. All that has changed with the arrival of third-party independently-provided meat inspection, allowing qualified inspectors to collect and push the data where it needs to go: back to producers. “It moves meat inspection from being simply an ‘accept/reject’ regulatory function to being something which can truly improve animal health outcomes, and beef industry productivity in this country,” Mr Maguire said. Feedback will begin to filter back to Teys Australia livestock suppliers later this year, from the company’s Central Queensland plants at Lakes Creek and Biloela; Beenleigh near Brisbane; Wagga in Central NSW and Naracoorte across in South Australia. Excellent initiative by Teys Australia to get valuable information into the hands of producers that will allow them to make positive changes to their management practices to improve performance through all levels of the supply chain. The challenge will now lay with the producer to utilise this information and instigate these changes, rather than just receiving the feedback for pure interests sake. This is really good news for the industry. I have found it very difficult and frustrating trying to get feedback from many of the feedlots – Teys included.